Once you create your account, we advise you to write down your password and keep it in a safe place. However, it’s natural that some people will forget or lose their passwords. In that case, you can reset your ProtonVPN account password by using your recovery email address as explained below. 1) Click the password reset link and enter your username and recovery email. Then, click the GET A NEW PASSWORD button. 2) You will receive a warning that your old password will no longer be usable. If you are certain that you would like to reset your password, click Confirm. 3) A new window with the “Reset code” field will appear. At the same time, you’ll receive an email with the password reset code at your recovery email address. Open a new tab, log-in to your recovery email address and copy the reset code. 4) Enter the code in the “Reset code” field as shown below, and click the RESET PASSWORD button. 5) You will get a warning message informing you that if you have a ProtonMail mailbox connected to this account, all of your existing emails will be encrypted with your previous password. This means that no one will be able to access them without your old password, including you. However, it is possible to recover and decrypt your old ProtonMail messages. To proceed with the password-reset process, type “DANGER” into the highlighted field, and click the RESET MY PASSWORD button. 6) Finally, you’ll be able to create a new password for your account. Just type your desired password in both of the fields, and click the SUBMIT button. Afterward, you will be automatically logged in with your new password. 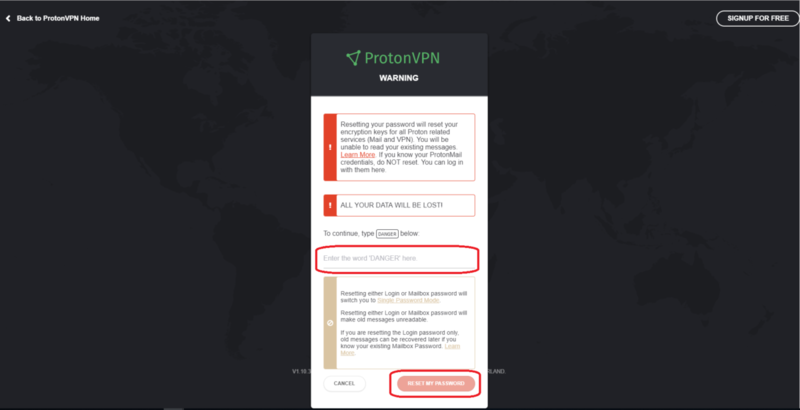 Proceed to use your newly created password from that point on for all ProtonVPN applications, including the ProtonVPN website. How to create a free VPN account?